This species is accepted, and its native range is Iran to Tropical Asia and Nansei-shoto, N. & E. Australia to SW. Pacific. Perennial. 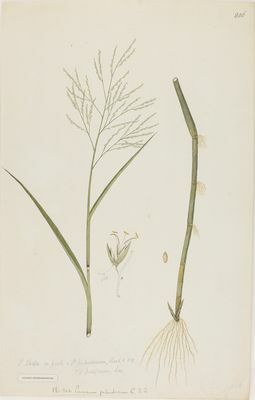 Culms erect, or geniculately ascending; 25-130 cm long; spongy; rooting from lower nodes. Culm-nodes glabrous. Leaf-sheaths loose; glabrous on surface. Ligule a fringe of hairs. Leaf-blade base broadly rounded, or cordate. Leaf-blades linear, or lanceolate; flat; 15-30 cm long; 6-14 mm wide. Leaf-blade apex abruptly acute, or acute. Inflorescence a panicle. Panicle open; oblong, or ovate; 10-30 cm long. Primary panicle branches whorled at lower nodes; 1-10 cm long. Spikelets appressed; solitary. Fertile spikelets pedicelled. Pedicels 2-8 mm long; scaberulous. Spikelets comprising 1 basal sterile florets; 1 fertile florets; without rhachilla extension. Spikelets lanceolate; dorsally compressed; acute, or acuminate; 3.2-4 mm long; falling entire. Glumes reaching apex of florets; thinner than fertile lemma. Lower glume orbicular; 1 mm long; 0.1-0.25 length of spikelet; hyaline; without keels; 0 -veined. Lower glume lateral veins absent. Lower glume apex truncate, or obtuse. Upper glume lanceolate, or ovate; 1 length of spikelet; membranous; without keels; 7 -veined. Upper glume apex acute, or acuminate. Basal sterile florets barren; with palea, or without significant palea. Lemma of lower sterile floret similar to upper glume; lanceolate, or ovate; 1 length of spikelet; membranous; 9 -veined; acute, or acuminate. 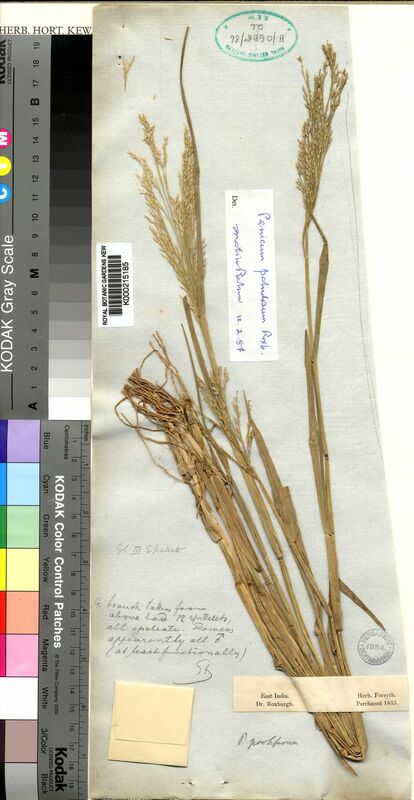 Palea of lower sterile floret 0-0.66 length of lemma. Fertile lemma oblong, or ovate; dorsally compressed; 2.25 mm long; indurate; pallid; shiny; without keel. Lemma margins involute. Lemma apex acute. Palea involute; indurate. Anthers 3; 1 mm long; red. Caryopsis with adherent pericarp; oblong; 1.5 mm long. Asia-temperate: western Asia and eastern Asia. Asia-tropical: India, Indo-China, Malesia, and Papuasia. Australasia: Australia. Pacific: southwestern. 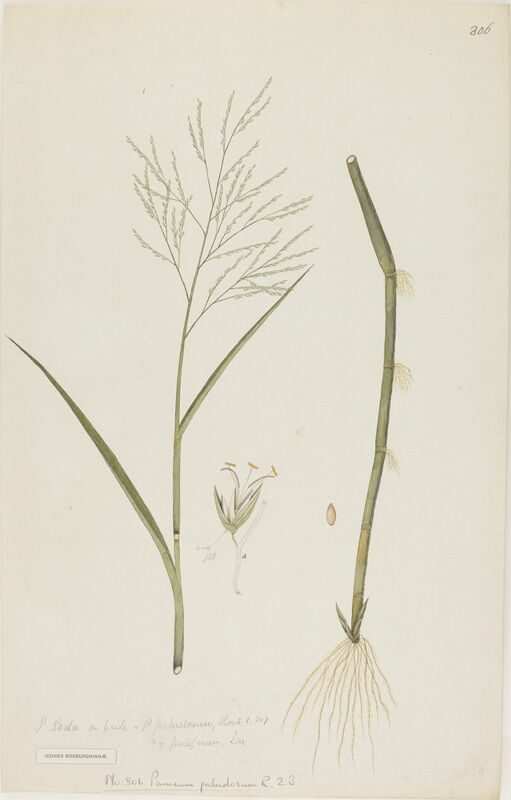 Panicum natans J.Koenig ex Trin.